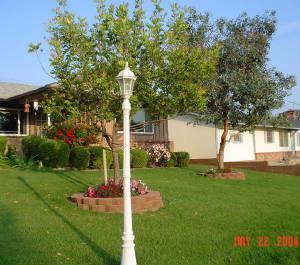 This portion of our site is a photo chronology of the transformation that took place in our yard between May of 1997 when I bought the house after a divorce and 2004 when our yard was part of the Yucaipa Iris Festival Garden Tour. The biggest changes, of course, took place after Fred and I married in June of 2001 when he did most of the hard work and we could afford what was needed! The photo to the left was taken in May of 2004. To see photos of how it changed through the years, click on a year link in the navigation bar at the top of the page. 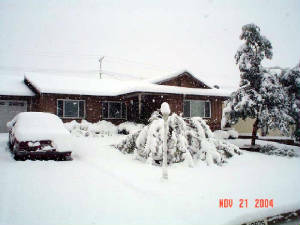 A rare snowstorm hit Yucaipa, California, on the Sunday before Thanksgiving, November 21, 2004. For the first time in 50 years, upper Yucaipa was buried in about one foot of heavy snow. Lower parts of the city received less snow because of lower elevation. As beautiful as it was, many trees, shrubs, and other plants sustained damage or were totally destroyed because of the weight of the wet snow. Our carrotwood tree in the front yard suffered the most damage of everything on our property. In September of 2005, we had it professionally trimmed; it now has lots of new growth and a beautiful shape!